karma chags med. gnam chos las thub pa gnas bcu'i dbang sgrub bsdus pa dang dbang bshad. 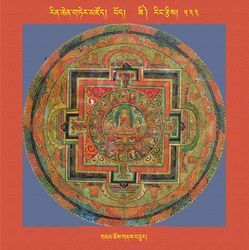 In Rin chen gter mdzod chen mo pod nga gnyis pa (The Great Treasury of Rediscovered Teachings Volume 52) by 'jam mgon kong sprul, 179-197. New Delhi: Shechen Publications, 2007-2016. This page was last edited on 21 February 2019, at 21:24.